I’ve uploaded the 2nd video about Orion Sphere LRP event 1, this time focusing on the wonderful UK Starship Bridge Simulator (UKSBS). Focusing on the ship missions at Orion Sphere, the combined efforts of the Orion Sphere (Conan Daly, Michael Rees & Nathan McDonald) and UKSBS (Wayne Street, Raymond Toghill & James Balls) teams was very impressive. Like any creative project, creating the ideas for a new game universe can become a black hole, filled with constant research. Add to this the care of managing the inspiration of other universes, whilst giving things your own spin; all of course with the time pressure of: eek the event draws ever closer! It was revealed at the end of the event that the two teams had not worked together before, making things more impressive. Orion Sphere has been designed to be a living universe, to allow the players to add lore and their own stories, to strive to maximise player agency. The UKSBS has helped create and run a key part of that universe, setting a high bar, which technically was not required to make Orion Sphere event 1 so impressive. To repeat what I say in my video: amazing! The Live Action Role Playing (LARP/LRP) event 1 of Orion Sphere was awesome. The next event is on the 21st September, you should join in 😀 (links below). Unfortunately this review is a bit behind schedule, due to health and other priorities. When I returned to finalising my thoughts I was once again unsure how to condense the emotional high and overall fun that I had at Orion Sphere event 1, so I decided to record a stream of consciousness and see what came out. I also decided to go an extra step for my overview and put on some of my kit for Lucian Thomson; failed surgeon to space docker now scientific explorer. The root of the kit and character idea came from a fellow player’s obsession with dungarees. As I mention in the video I think the game combines some of the scale of a festival LARP along with a smaller club / convention LARP was impressive. Considering the crew and players I am sure this spirit will be maintained, especially as the game grows. Having a setting that brings classic Sci Fi like Star Trek, Star Wars, Stargate, Battlestar Galactica, Firefly, and so many others was a great starting point. As I mention in the video the four Factions help set the stage for player plot and tension, building upon a rich and growing lore. Like most people I’ve so many things to do, but I’d like to write some lore and after event 2 I’ll chat with the design team about this. Preparing to fight/save the hive. The ship simulating setup added a great immersive aspect to the game. I am sure the game would have been good enough without the UK Starship Bridge Simulator (UKSBS), but what Wayne and Raymond brought uplifted the game to cosmic heights 😉 I will go into more detail about them in the next blog. I went with a silly but heartfelt video for today’s question; I clearly need to practice puppet skills, or my dreams of a puppet RPG will never happen. I had pondered mentioning more things, but I decided to save them for a post-RPGaDay analysis, like I did last year. I’m still a bit tempted to go a bit overboard and carry out a psychology content analysis, but too much TODO and I am trying to stick to Project Overlap 😉 At least taking part and looking at some many tweets, blogs and vlogs means I got a decent overview of answers, which whilst taking a lot of time was very informative and fun. When discussing role-playing I typically mention Intent, whether it is about something that is In Character (IC) or Out Of Character (OOC). This approach grew out of my early experiences of being in games with Adversarial stances, both players and person running the game. I like to have clarity of what a person is trying to achieve, not just IC but also OOC. I don’t obsessively ask the question, I let me players know they can clarify something at any time during a game, and just occasionally check with them if I feel I might be missing something. I find this approach has allowed me to empower not just the players but myself as the GM, and ideally the game as a whole. I’ve learnt a lot more from particular characters and RPG in general. Empathy, culture, history, art, etc. But since we are keeping things short Intent is my main takeaway, which I also use in day-to-day life a lot. 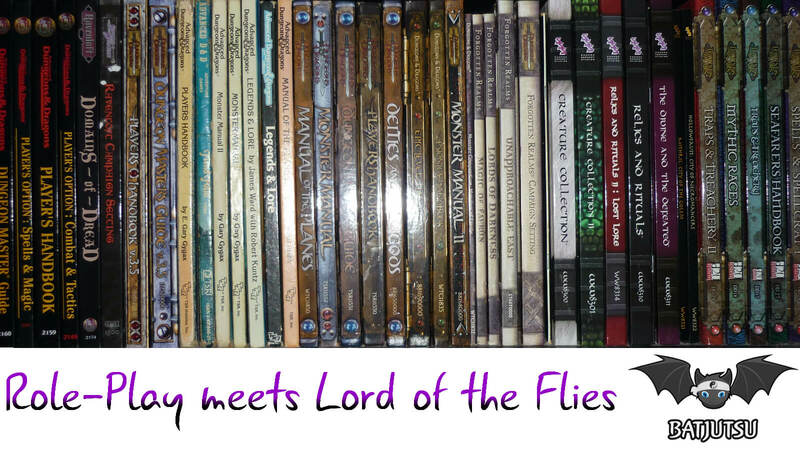 The story of my first regular lunchtime High School gaming group: Role-play Meets Lord of the Flies. My answer to the 29th question is a day late since I slept most of yesterday. More slow health improvements, whilst having the classic odd feeling of being more tired. Another great RPGaDay question, it was nice reading/listening to other people describing their friendships. Granted some view this question as being too sentimental, but I think that this question captures a core of the RPGaDay’s message: positivity. Another thought that occurred to me after I made the video is how this question ties back to Connections, they are a core part of role-playing, whether connections to people and/or ideas. Connections help provide meaning and motivation, just as they do in real life. As I mentioned in the video: anyone that puts effort into playing. I adore excellence, but I appreciate effort far more! The Peter Austin blog I reference is 5 Positive Role-Play Lessons. I blogged about Richie Janukowicz: Inspirational Friends.